The Fermi Large Area Telescope can detect a brightening or appearance of a gamma ray source, even toward the bright steady glow of our Galaxy. This allows the study of transient and variable Galactic sources that were very difficult to see with Fermi's predecessors. Many of these new sources have been a complete surprise like the novae discussed in last week's post. normally sweeps across the sky during one 95-minute orbit. In addition to locating variable gamma-ray sources while scanning the sky as shown above, Fermi can point to a particular location to spend a little extra time on a source doing something interesting. This is called a Target of Opportunity observation. Because the Large Area Telescope field-of-view is huge - subtending about as much of the sky as you can see with your eyes in any instant - the best use of the observatory is to scan the sky, keeping watch for unexpected events, following variability over the entire sky, and building the deep survey. However, occasionally something is so unique and short-lived, that it makes sense to point the Large Area Telescope toward that source to capture as much of the activity as possible. There is a limit to this because in low Earth orbit most sources are occulted by the Earth for part of each orbit. A pointed observation typically doubles the time a source can be observed, but most sources are viewable for less than half of the orbit. gamma-ray sky map with bars highlighting the position of the Crab. 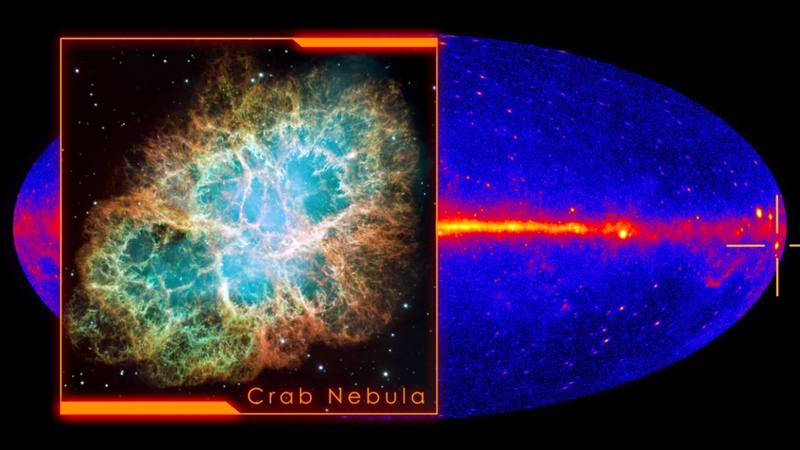 One of the most surprising and rewarding uses of this ability involves unexpected variability in the Crab Nebula. In September 2010, the European Gamma-ray Mission AGILE first reported and Fermi confirmed an extreme flare in gamma rays from the direction of the Crab Nebula, a very well-known supernova remnant. The event was not likely to last long, prompting observers to request a target of opportunity observation. Fermi departed from scanning and pointed at the Crab to capture as many gamma rays from the outburst as possible but that flare ended before the targeted observations began. Before Fermi was launched, scientists knew they would want to be able to quickly point the observatory at unplanned targets. They worked with the spacecraft designers to include the ability to repoint the observatory to a position of interest on demand. This can be done quickly, but because the observatory departs from the planned orientation, scheduled downloads of the data can be missed until a new plan is scheduled and uploaded to the spacecraft. That means there is a delay in getting data exactly when something really interesting may be happening. Fortunately, after a target of opportunity observation begins, schedulers quickly design a new plan and send it to the spacecraft to continue to track the source while also permitting data to reach the ground promptly. The Crab has gone into outburst in almost every year of the mission, reaching different peak brightnesses and lasting for different durations, from days to more than a week. In fact, it is flaring again right now! After the initial flares were found, scientists learned to act very quickly to request pointed observations that provide extra coverage of the Crab during bright flaring episodes. At those times and with sufficient coverage, measurements can be made on timescales shorter than an hour. In particular, the target of opportunity observation made of the brightest flare to date in April 2011 caught the peak of the outburst. The dedicated coverage provided a movie of how the distribution of energies of the gamma rays changed throughout the flare. The changes in the gamma rays allow more sophisticated tests of mechanisms that could be speeding up matter to high energies and producing gamma rays extremely quickly. 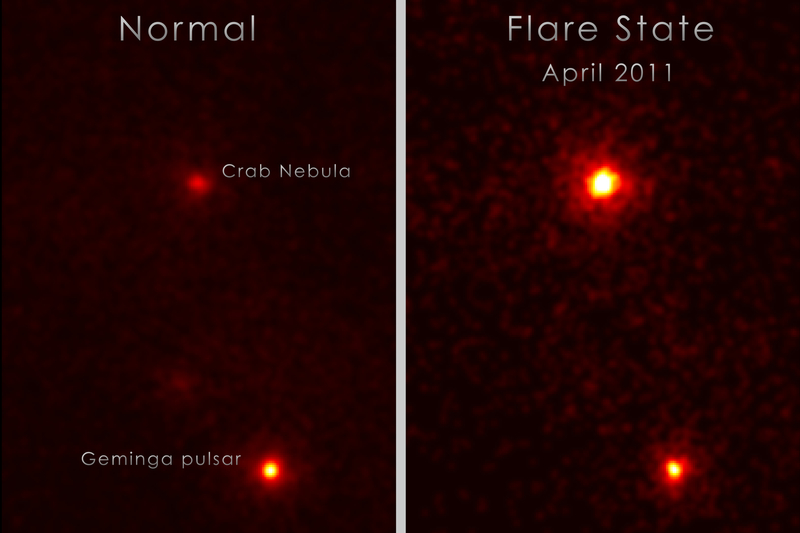 Many other telescopes, including NASA's Hubble and Chandra Observatories, the Jansky Very Large Array and the W. M. Keck Observatory, have pointed at the Crab during gamma-ray flares to look for correlated activity, but so far only the gamma-ray band has shown notable changes associated with the flares. Fermi will keep watching.